This year an exciting new blog called Respectfully Connected was started. It is a collective blogging project with 15 authors, all of whom have Autistic children and some of whom are Autistic themselves. 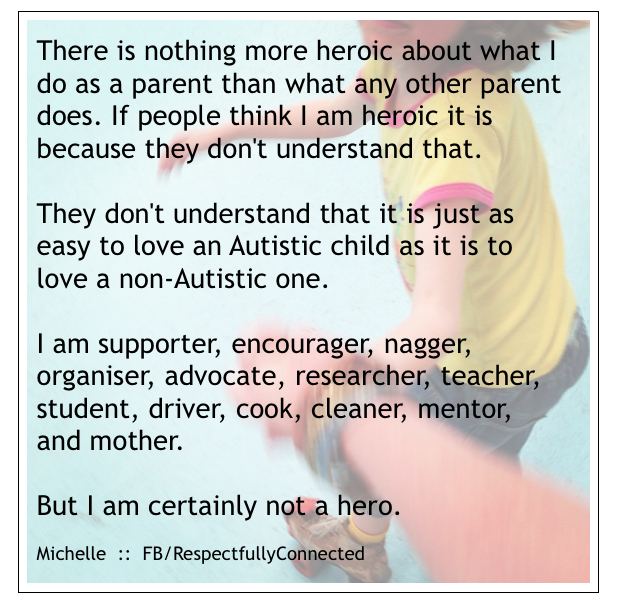 The blog focusses on parenting Autistic children respectfully, valuing Autistic children as they are. I am honoured to be able to say that I am one of the authors, and along with the other wonderful people involved, am really enjoying seeing how this project is unfolding. Today I am going to share with you the articles I have posted on Respectfully Connected so far. Please do have look around the blog at the other articles there. All of full of wisdom and compassion- well worth your time. is told by well meaning listeners how heroic I am? Wow. I don't know how you do it. Good for you for supporting them so much. You are amazing to put up with all of that. Well, I'm not sure exactly what it is people think I do, but I'm pretty sure they don't understand my life at all. …..
All the "continue reading" links will open in a new window on your browser, so you can easily come back and keep reading here. Enjoy!